2If the full moon has you questioning gut bugs, here’s what you should do. You might think this is a little superstitious, but there is something real about how the full moon impacts people, animals, and the things around us. Have you ever noticed that there seems to be something cyclical when it comes to being moody and irritable? And I’m not talking about PMS, but a fluctuation in mood that only lasts for a few days for some reason and is unexplainable. Or what about sleep disturbances—going through periods of time when you have trouble falling asleep or tossing and turning that only last for a few days or a week at a time? How about your digestion? Do you experience phases of really great bowel movements and then all of a sudden they seem to go on the fritz? And then there’s stuff such as skin rashes or breakouts, teeth grinding, and joint aches and pains. Do those come and go too, every few weeks? Looking back now, were any of these things—or other ailments that you might suffer from—worse around a full moon? There are frequently times when I catch myself noticing how my behavior is off, and I feel a little restless or uneasy in a way that I can’t quite put my finger on—until I check the calendar and realize a full moon is upon us. With myself and in my private health coaching practice, I see these common characteristics all of the time. It’s not a coincidence, it’s science. During a full moon, ocean tides are higher than usual from an increase in the gravitational pull from the moon and sun. Considering that the body is 80 percent water, scientists and astrologers have often thought that similar effects happen in the body, almost creating a “human tidal pull” that can affect brain function. But parasites are more likely to be the real thing driving you crazy or causing suffering during a full moon. The gravitational pull on water balance in the kidneys causes a shift of movement or an “awakening,” making these little buggers more active during the full moon cycle, which then wreaks havoc on your intestinal health, digestion, and hormone balance. An overgrowth of gut bacteria and/or yeast such as Candida can also have similar effects during a full moon. The most common parasite usually found is Blastocystis Hominis (Blasto). Blasto can be persistent; it’s commonly correlated with autoimmune issues and likes to hang out with another bacterial gut offender known as H. Pylori. The classic symptoms of H. Pylori can include: heartburn/acid reflux, ulcers, migraines and mid-back pain. But there are a bunch of different species of gut invaders that could be disrupting our balance during the full moon. We come across gut invaders all the time, and if the gut is already compromised, they move in and take over. Over the years, I’ve had my fair share of gut invaders including Blasto, H. Pylori, Candida, and a few other species as a result of being exposed to toxic mold, traveling internationally, and having Hashimoto’s disease (an autoimmune thyroid condition). Once I eradicated those suckers, my symptoms subsided and I no longer experienced such swings in my health and well-being during a full moon. If the full moon has you questioning gut bugs, here’s what you should do. Starting now and for the next few weeks, jot down any symptoms, aches, pains, ailments, or health complaints that you’ve been experiencing on a scale of 1 to 10 with 10 being the most intense or present. Then, start tracking the progress of those symptoms. You’re looking to see if they improve and/or go away in the coming weeks, especially leading up to a new moon when these gut infestations are most dormant or if they increase in intensity leading up to a full moon. Based on your tracking, check to see if you notice any trends or if anything seems like it indicates a pattern. 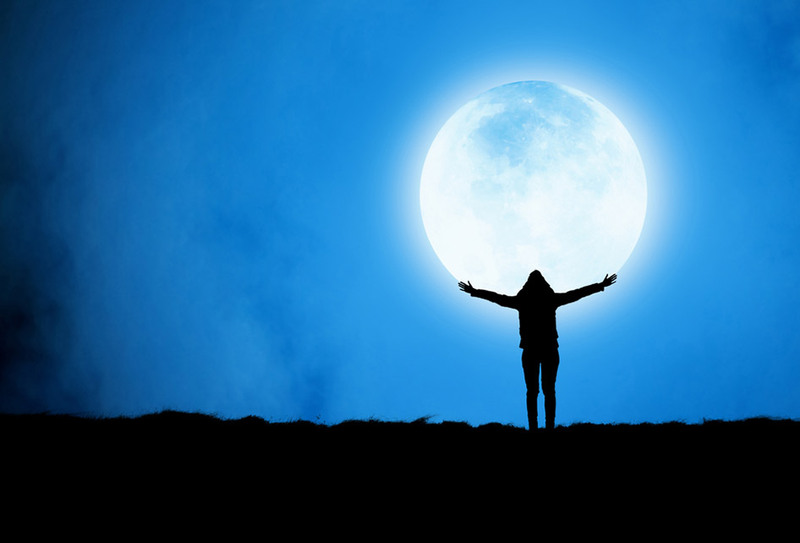 If you notice an increase in symptom intensity around the full moon, this is a sure sign that it’s time to dig deeper. Parasites are no fun, but they don’t have to hold you back from healing or reaching your optimal health. Once you have a good indication of what’s going on, you have what you need to take the next step. Use that knowledge and become your own health boss so you can regain your health and happiness!